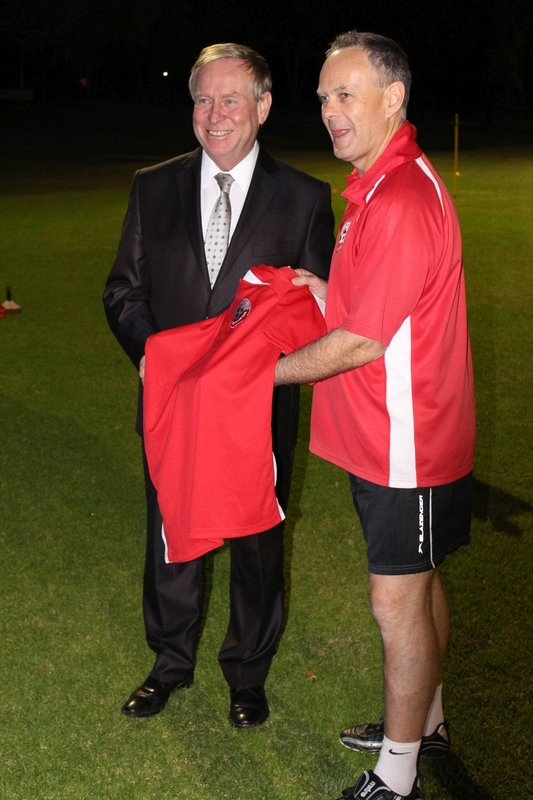 Club president Keith Anderson hands a jersey to the Premier. Celebration Park in Balga has been the club’s home ground for two years during which the club’s eight teams and 75 players have had to use the old, dilapidated male change rooms. Premier Colin Barnett announced the funding at a training session last Thursday night where he declared he was the club’s biggest fan. ‘The Northern Redbacks Women’s Soccer Club typifies what grassroots sport is all about and it can be proud of what it has achieved even though it operates from facilities that are run-down and unsuitable,’ he said. ‘The club is one of the most successful women’s soccer clubs in Western Australia but it doesn’t have women’s change rooms, so players are forced to change in the men’s toilets, which are in poor condition. City of Stirling Mayor David Boothman said the grant allowed the City to allocate money from its budget to improve the ‘old and crappy’ facilities to have a kiosk and a comfortable place for the players and spectators. Club president Keith Anderson said the club was elated to be getting new facilities that would meet the standard of the pitch and the floodlights that were installed by the City last year. ‘It will mean the premises here will now better provide for our female soccer players and hopefully help attract more players,’ Mr Anderson said. ‘State junior teams have been playing at the ground so at times it caters for up to 10 teams.